Here at ROCA Sports Ireland we pride ourselves on excellent customer service. We know that you don’t want to wait days for your order to arrive. That’s why we send every order within Ireland by GLS, TNT (For bikes) or An Post parcel post. Which means that, all being well, you should receive your parcel within 2 working days after it has been despatched. However, although we promise to despatch your order quickly, it should be remembered that delivery is not guaranteed within this timescale and parcels can occasionally take longer to reach their destinations. How will my parcel be sent in Ireland? All parcels sent within Ireland will be sent using the companies listed above, a flat rate charge of €5.95 applies to all orders with the exception of full RRP bikes for which there is no delivery charge. 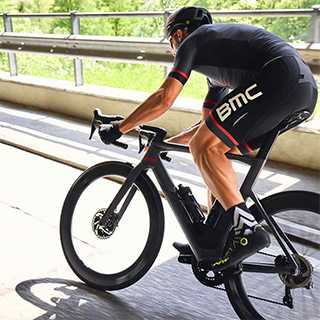 For BMC bikes ordered online will be sent with either TNT or GLS Europe. For BMC parts An Post Parcel service or small packets will be used. We can arrange to ship certain items overseas on request, please use the contact information on this site to get in touch with your request. Rates for shipping are usually very competitive for the rest of the EU. When your order has been dispatched you will receive an e-mail notification advising of of this. Help! I haven’t received my parcel, what should I do? Contact us – we will do anything we can to help. If an item sent by An Post has not been received please check with your postman if it may have been left somewhere or if a card has been left advising you of a parcel being left at a local Post Office for collection. If not, An Post has a specific procedure that we can follow in the event of a missing parcel. If your order has been dispatched with TNT or GLS then we can track and trace it using their online system. For deliveries to Europe and the rest of the world, if your item is not collected and is returned to us then we will issue a refund minus the cost of postage to ROCA Sports Ireland. If not received, these items will not be deemed to be missing until two weeks have passed. ROCA Sports Limited accepts the following methods of payment through Sagepay. You will be directed to a secure server where payment takes place. We also accept Paypal, a secure and easy method to pay for your goods. If you use this method of payment, your Paypal account with be debited upon placing your order with us. Please note we do not accept Paypal Cheque payments. Save up to 42% off a new bike with Bike to Work. To find out more, click here. This scheme is not redeemable online and we advise contacting us on sales@rocasports.ie for more information on this. We offer 0% finance from Flexifi on all purchases over €1000. Full details on this can be found here: Flexifi finance details. We are unable to offer finance on sale or clearance bikes. Whilst prices and specifications have been checked, no responsibility can be taken for errors or omissions. ROCA Sports Irl reserve the right to alter prices and specifications without further notice. Occasionally, an error may occur and goods may be incorrectly priced in which case we will not be obliged to supply the goods at the incorrect price or at all. If we are unable to contact you or you do not wish to continue with the order at the correct price, we will cancel your order and refund the price you have paid. We reserve the right to cancel an order up to the point of delivery. If at the time of ordering any items are out of stock we will advise you, via email or telephone of any shortfall and provide a revised despatch date. We will despatch the in-stock items by the next working day at the latest. We want you to be 100% happy with your shopping experience. Please insert your proof of purchase into the package and return to us. If you wish to exchange an item for any reason, the quickest and simplest way to do this is to place a new order for the items that you want and to return the other items for a refund. Please note that it is your responsibility to pay for the return postage costs, no postage costs are refundable. We cannot assume responsibility for returned items that are lost in the post. Your statutory rights are not affected. Include all relevant information including the reason for return and a copy of your invoice. Include this information with the item and package up securely. Do not affix the postage label to the product packaging (shoe boxes etc.). Please note, we will not refund any postage fees (except if the goods are faulty or if you have received a wrong product). We strongly recommend you use a service that provides a certificate of postage and a tracking number. Do not affix the postage label to the product packaging (shoe boxes etc.). Make sure the following information is included with your return. Should you have any questions please call us on +353 87 207 3049.